Marvelous Frittata recipe from AlmazanKitchen! What is frittata? Frittata is egg-based Italian dish similar to an omelet, with additional ingredients! 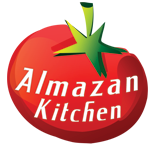 The main ingredient in today’s frittata is an AlmazanKitchen passion! Plus some homegrown veggies and pancetta! Blue cheese is a really great addition for this dish, do not miss it! Video includes dose of both ASMR and Foodporn! Enjoy! Remove the seeds and slice 4-5 bell peppers. Unpeel and slice 1 onion. Toss in the peppers, onions and pancetta. Fry and stir until crispy golden brown texture. Cut in half handful of small tomatoes, place in the pan with inner side down. Toss 1 cup of peas into the pan. Slice 50g of blue cheese, add into the pan. Crack 6 free-range eggs, salt and pepper it, grate 20g of parmesan. Whisk everything well. Pour whisked eggs into the pan, cover with lid and cook few minutes until ready. Take more journeys, love the nature, and cheers to you all! Mouth watering recipe. Excellent combination of ingredients and blue cheese is the crown on top.